This educational tale of the migration, mating, and nesting habits of a pair of robins as they raise and care for their young will delight parents, teachers, and children. Beginning with the welcome return of the robins in early spring, simple language and beautifully detailed colored-pencil illustrations reveal exactly what is happening in those nearby but hidden nests. Included are kid-pleasing details, such as the fact that a newly hatched robin equals the weight of one nickel, and that each robin can eat up to 14 feet of earthworms a day! A glossary, breeding-season time line, and tips on helping injured or orphaned baby songbirds make this book as practical as it is charming. 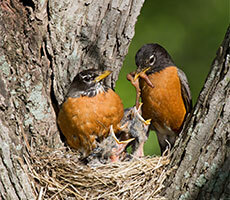 Describes a year in the life of a pair of robins as they build a nest, lay eggs, and care for their young. Whether they live on the same block or on opposite sides of the world, kids and grandparents can make memories and bridge the generation gap with this fun-filled activity book in the Family Fun series created just for them! Children will enjoy learning the games their grandparents played (remember cat's cradle? ), and grandparents will get a kick out of the gifts they receive from their grandkids. Together they can research the family tree, make a birdfeeder, plant a garden or create their own memory book. Regardless of which activity they choose, they will treasure the time they spend together. Tuesday, June 24, 9:30 - 11:30 a.m. This day is designed to be an opportunity for you to enjoy a morning outdoors with your grandchildren. 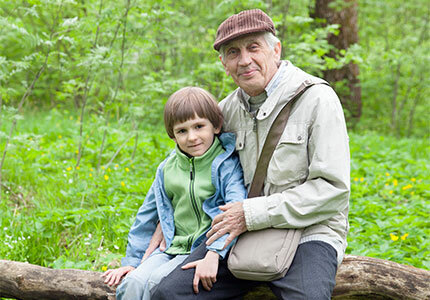 The program will encourage grandparents and grandchildren to engage in nature related activities together while experiencing the outdoors at Oakdale Nature Preserve. Northwest Illinois Audubon Society facilitators will provide the activities, along with instruction of things to do with your grandchildren. Activities will be most applicable for grandchildren between the ages of 7 and 12. We will meet in the Mogle Center, although be prepared for most activities to be done outdoors. Space is limited for this program so advance registration is required. Call Richard Benning (815-865-5279) to register or for more information. The American Robin is known for its bright orange belly and beautiful song. The male will sing a most beautiful tune... “Cheer-up, cheerily, cheer-up, cheer-up, cheerily.” He is often the last bird heard as the sun sets. Robins are known for their running and stopping behavior — it is one of their main characteristics! 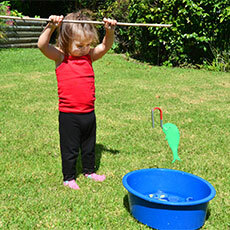 For those rainy days, a make-believe fish pond can be a lot of fun. Materials needed: Construction paper of different colors; a twig or pole; paper clips; magnet; crayons, string or yarn. Draw about 10 fish on different colored pieces of construction paper. Cut out and put a number on each one. Attach a paper clip to the head of each fish. Tie a string around your twig or pole and tie on the magnet. Now you are all set to play. Take turns fishing out a fish with a number on it. When all the fish have been caught, the person with the most points is the winner. This is a great game to teach basic colors and numbers. Can you catch all the yellow fish? What numbers did you catch? 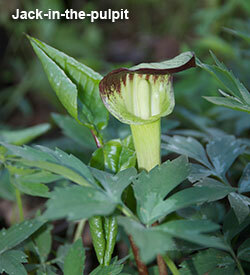 Before going outside with children, take a walk yourself and find an area where a few different tree species grow. Collect several object from the ground underneath the trees like nuts, leaves, bark, blossoms; Place the objects in a "mystery box" so they can be felt but not seen. An old shoebox works great with a hole cut in the lid large enough to get a child’s hand through. Take the children to your collection spot and have them feel the items in the mystery box; challenge them to name the item and search the collection area to find the matching objects. What is important about your sense of touch? How do you use it every day? What would life be like without your sense of touch? Can you identify more objects by only feeling them? Let’s find some more! 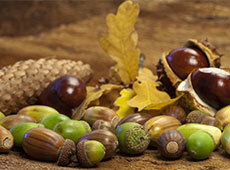 *This activity taken from the American Forest Foundation.